Our dual track retractable screens combine our sturdy screens with the protection of our vinyl panels. Together you have the versatility of a super strength vinyl screen to eliminate rain and wind along with a rugged, retractable screen that lets you enjoy the weather without pests, heat and rain. Many customers choose a dual track option for barns and utility sheds. Many restaurant owners choose this system for patios and smoking areas. It gives you the flexibility of non-permanent weather protection along with ventilation. Our Dual Track Retractable Screens work with any kind of Window! It’s easier than you think to get dual track retractable screens for the windows in your home or business. 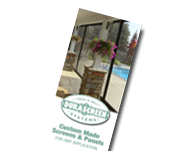 Whether you’re looking to partially enclose a patio or add a screen to your garage, DuraScreens will work with you to affordably fit a screen for almost any outdoor area. Contact us today to learn more.